Lower The Tone returns in September 2014 with a Charity Special hosting Female Vs Male DJ battles all night in room one! Expect the usual mulit-genre mash-up of everything Bassy and Bouncy including Drum & Bass, Techno, Breaks, Electro, Ghetto Funk, Disco and bassline. Storm has always been one of the most influential DJs within drum & bass, known for tight mixing skills and an exclusive selection. Affectionately dubbed the ‘First Lady of Drum & Bass,’ she represents Metalheadz at their residencies, label nights and tours as well as countless solo gigs. Having been involved from the very start of the label alongside her great friend and DJ partner Kemistry, Storm’s contribution has been immense and critical in helping to build the reputation Metalheadz has today. She has toured the world over and continues to enthral crowds wherever she goes and has also linked with other like-minded female drum & bass artists to form Feline. Recipient of the best female DJ award 4 years running from 2009 - 2012 at the National Drum and Bass Awards, Storm’s powerful and professional style remains a strong favourite with true Drum and Bass fans around the world. With a reputation stretching back to the foundations of drum & bass, Storm’s early career was built alongside that of her great friend and DJ partner, Kemistry. Sharing a passion for music and clubbing, they were inspired by the emerging breakbeat sound championed by the likes of Fabio and Grooverider at legendary clubnight Rage. Determined to become involved in this new and exciting scene, they set out on a path to become DJs and bought their first decks together in October 1991. Around this time they met an aspiring young artist by the name of Goldie and began a regular show on London pirate Touchdown FM, with Goldie hosting on the mic for the two upcoming DJs. In 1994, Goldie founded Metalheadz with Kemistry & Storm at the core. Having spent 4 years in Australia running his club night Rescued , Exposure has returned to the home of Drum and Bass to further pursue his passion for the music he loves. Still using the much discussed vinyl format, he plays on 3 or more turntables and destroys dance floors with his lightning fast mixing style and varied tune selection across the whole spectrum of Drum and Bass. Putting many hours into his production in the studio and working with other producers, vocalists and musicians, you can expect to hear some fresh new tracks guaranteed to get you moving! Lower The Tone: Breaking Boundaries is an event raising awareness & funds for projects dedicated to deaf, blind children and young people across the globe, through the medium & love of electronic music. BY COMING TO THIS EVENT YOU CAN BE IN FOR A CHANCE TO WIN TWO TICKETS TO CLUB 'SPACE' IN IBIZA FOR THE HUGE SOLD OUT EVENT WITH FLIGHTS PAID FOR!! Tickets: £6 Advance/Before 12 - £8 After. 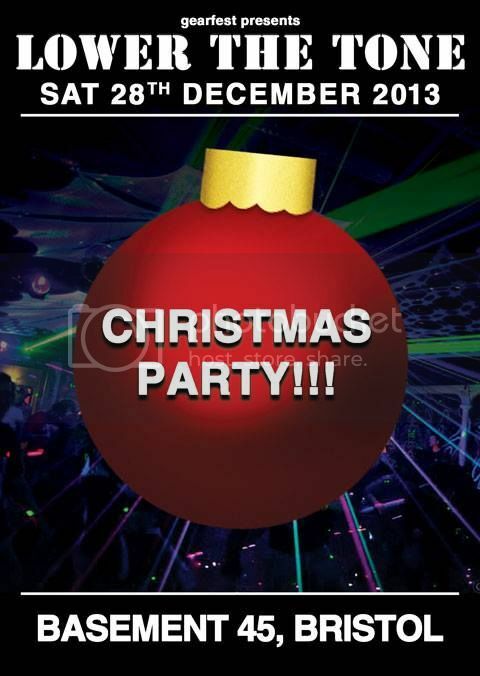 The next Lower The Tone lands itself between Christmas and New Years Eve so expect Christmas themed fun and madness! Huge Line-Up again featuring the amazing Gearfest DJs! This time we have two special rooms. The 'Good' room, for all the lucky boys and girls that have been good this year. Then the 'Bad' room, for all the boys and girls that have been very naughty! Amazing Decor provided by Ink Junkie. Expect the full festival feel with Cakes, Balloons and lots of happy faces!! I have some krk rokit 5's in great condition but thinking of possibly now i have more money getting some bigger ones. Was wondering if anyone out there has any KRK rokit 8's that they dont use that much but still want a great sounding speaker. If i gave you my rokit 5's and some cash for your rokit 8's then you would still have some quality monitors plus some cash. i have a free acetate 12" disc thats uncut if anyone has any need for it. I was given a load at uni as a thank you for trying to get their vinyl cutter to work. Join us for this one-time only, as Raise the Tempo takes your night from the funky to the filthy, courtesy of man on a mission & festival owner Mr Trout, incredible live 8 piece afrobeat/funk/hiphop band & Boomtown veterans Afro Cluster, our favorite resident Bristol funkster Powercut, legendary ghetto funk all-star and one of the ultimate party DJ's Featurecast, and local lad GRAHAM-ACIDIC unleashing his 30th birthday set to end your night with the electro-filth and dirty dubstep in the best of Bristol music traditions. Described as Mr Midas Featurecast has proved himself to be a leader in his field. From DJing to Producing this guy is a juggernaut tearing down the scene with his impressive catalogue of chart topping releases and his skills on the decks acclaimed world wide. Less a slavish Afro-Beat copy, more a re-fix with today's influences mixed to a similar recipe, let Afro Cluster move you - it's all we're after! 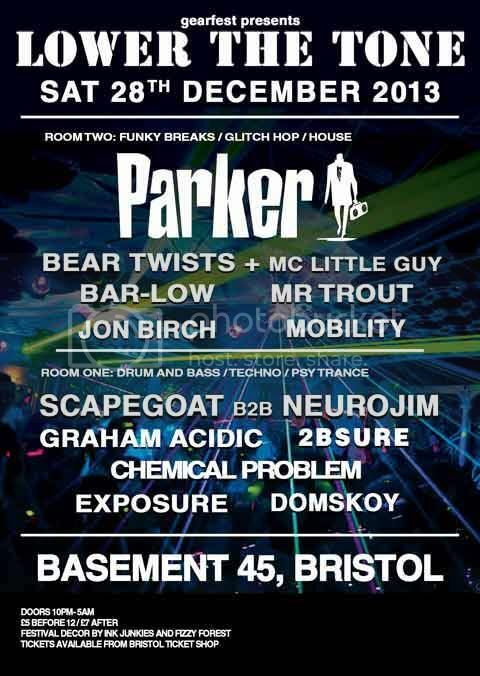 Powercut is one part of Bristol based DJ/promoter collective Funk From The Trunk, most known for his party rocking DJ sets and break-heavy mixes. 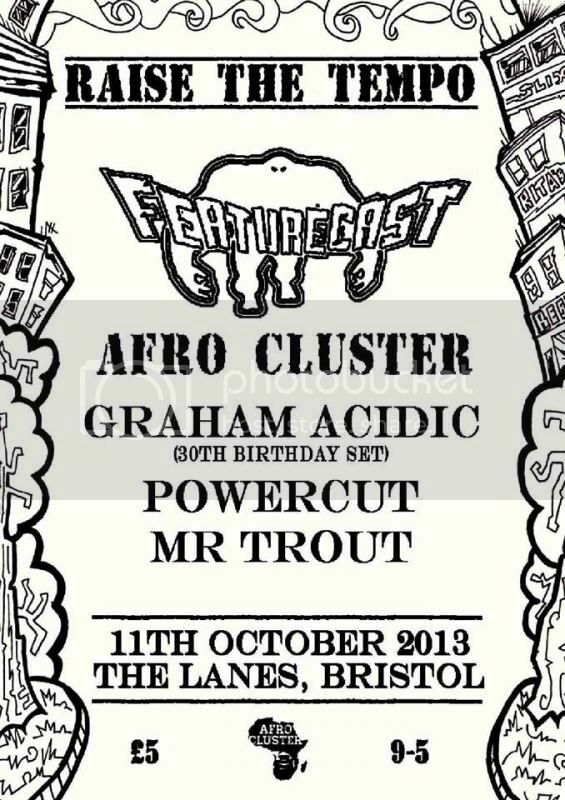 Powercut has also been resident at a number of Bristol based club-nights over the years and had played festivals across the UK and Europe. Man with a vision, Gearfest festival owner, fish lover and all round fun guy Mr Trout brings the best in glitchy funky fishy beats to open the night and get your night going: A man never to be underestimated! big ups to franky, he did a great job. I found them pretty meh, but then I don't really like house. Lower The Tone is a promotional night for Gearfest festival featuring some amazing Headline acts and the amazing Gearfest DJ's for just a fiver!! Full Made By Hippies Jungle Decor! 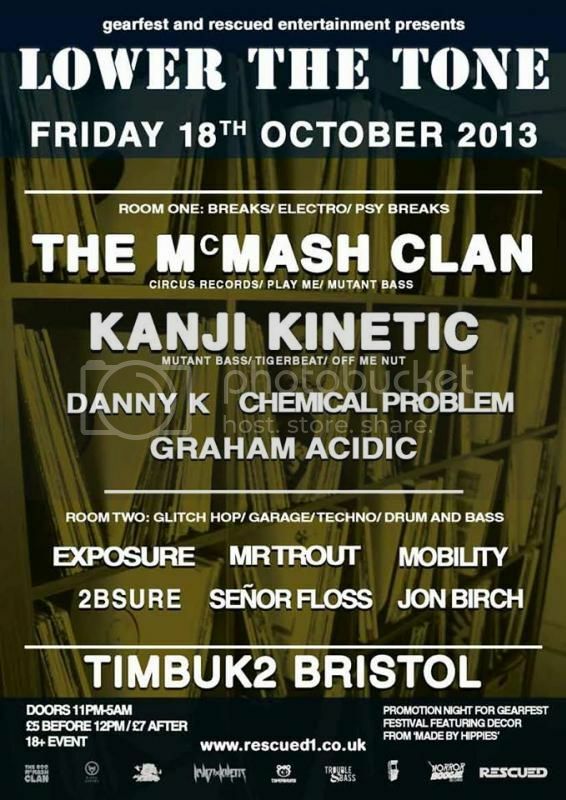 The McMash Clan are a London based 3 man production / dj team fast building a reputation for destroying the biggest dance floors with their 4-deck live show and high octane productions. Flux Pavilion signed their current Swing Break EP to Circus Records this summer and the subsequent industry/ public response has been massive. Released on 21 October, the EP has had heavy DJ/ radio support from the likes of Skrillex, Flux Pavilion, Mistajam, DIllon Francis, Jaguar Skills, Dirtyphonics, Lazy Rich, Excision, Far Too Loud and Borgore. It's had regular play on BBC Radio 1 / 1xtra. 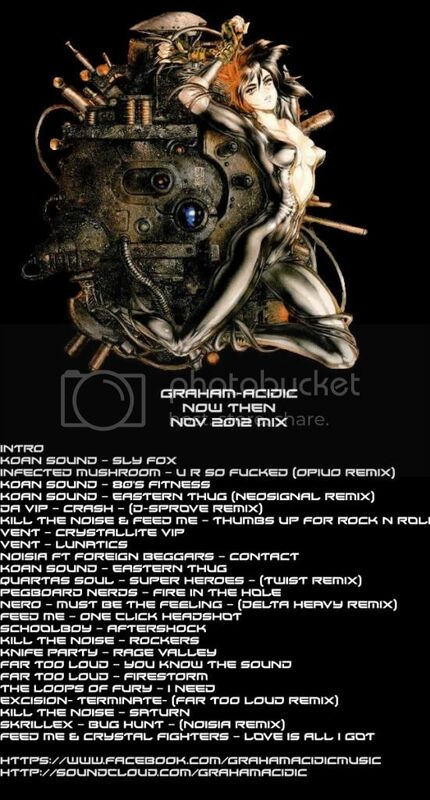 The title track reached number 1 in the Track It Down dubstep/ moombahton charts. The song features a vocal written and sung by Kate Mullins of world renowned swing punk vocal trio The Puppini Sisters. John B has just released their official remix of his single Connected on his label Beta Recordings. He's been opening / closing his sets with the remix since January, and was the opening tune on his Drum & Bass Arena TV set in February.The remix has already gained dj support from Doctor P, Datsik, Qemists, Cutline and High Rankin. The Clan's high energy live show sees them hook up Traktor and NI Maschine for a peak time 4-deck assault; cutting, scratching, reediting and triple dropping their way through a multi-layered mash-up of rave-bass lunacy. The strength of their live performances has already seen them smash big stage festival slots at Glastonbury (Arcadia spider), Secret Garden Party and Boomtown Fair. im looking for a self catering mansion/cottage for a stag do in bristol but struggling to find somewhere suitable, needs to be a place not next to any other residents as we plan on getting a sound system for a party on one of the nights. was wondering if anyone knew of somewhere to hire as i know a few of u on here have organised stag parties before.